How to automatically update my feeds (on-the-fly output or CRON task)? If your catalog contains less than 1000 products, in your Business Manager account, you can indicate, for each feed, an "on-the-fly" output URL (i.e for a real time recovery). If you want to import your products in different catalogs, according to the "language/country/currency" group, click here to follow the guide. If you want to import a product feed in the catalog connected to the native "Shop" tab of your Facebook page (this will only be for one language and one currency), click here to follow the guide. 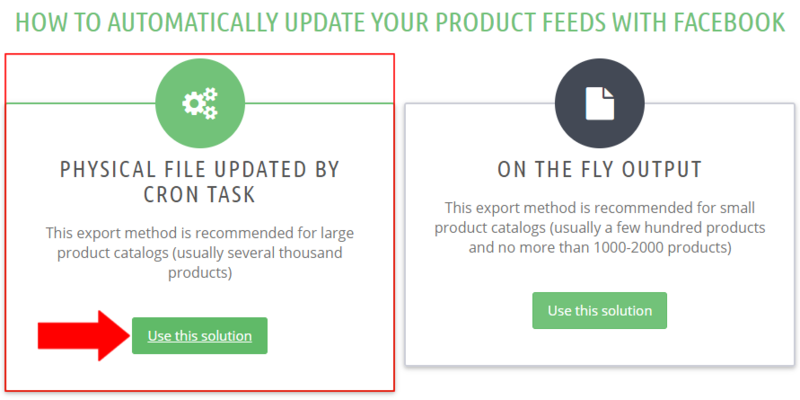 If the import was successful, you can keep this "on-the-fly" product import/update method! If not, it's possible that your catalog is too large: the "on-the-fly" output takes too long and the script times out before it can entirely generate the feed. In that case, you rather have to use a physical XML file (installed in your server) that will already contain all feed data and that will be updated regularly by a "CRON task". Go to the following section. If your catalog has more than 1000 products, your server may not be so powerful to support an "on-the-fly" output. You indeed need, before Facebook retreives your product data, to copy them in a XML file, that is "physically" on your server. This file will then be retreived by Facebook. Of course this file has to be updated regularly, to make any changes you may have made in the meantime. So, the first thing to do is to intall an automated task that will update this file, at a frequency you'll decide on : it's what is called a CRON task. To technically set a CRON task, read our dedicated FAQ by clicking here. Note that if you don't have any technical skill, you can ask your webmaster for help. If you want to set a general CRON task to update several feeds in the same time: in this case, check the feeds you want to update and click "Save" (on the right). 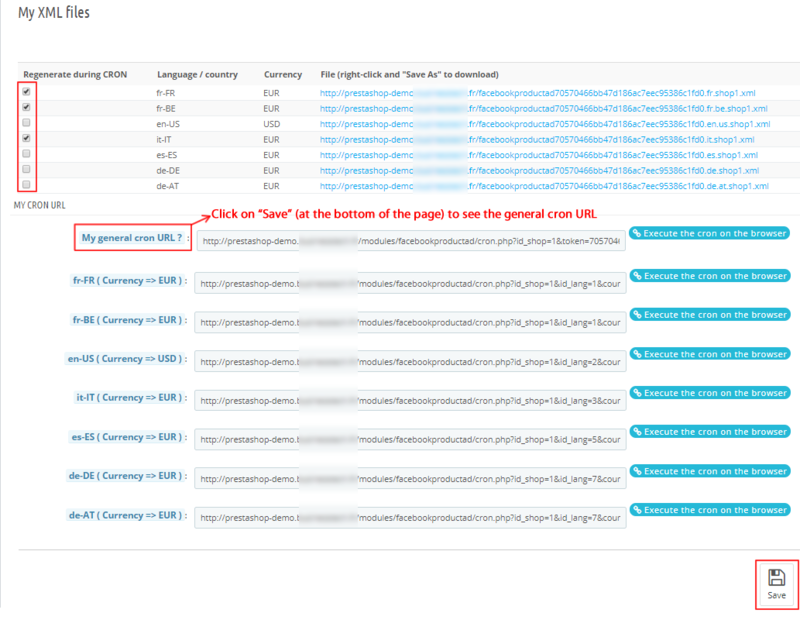 After that, a general CRON's URL will appear in "My CRON URL" section. It's this CRON's URL you have to copy. In the following example, the 3 feeds : fr-FR, fr-BE and it-IT, will be updated at the same time when the general CRON's task (surrounded in red) will be executed. If you want to set a CRON task for each of your feeds, in order to update them one by one, in a time-shifted manner (to avoid a servor time-out): in this case, don't check anything and copy each CRON's URL one by one (that is to say the URLs that are under the general CRON's URL, in the example above). It's this solution you will have to use if you tryied to execute the general CRON task (as it's explained in the first bullet point) and you noted that all your feeds weren't correctly generated (the data number is too large to execute several feeds at the same time). How to import my products into a catalog I created? How to import my products into the "Shop" tab of my Facebook page? How to match my products with Facebook categories? How to create and install my Facebook Pixel? How to configure the module ? How to test my Pixel code? How to create custom labels to segment my catalog? Do I have to include the LANG ID in the product ID? How to create advanced exclusion rules? How to fill my shop's URL? Do I have to ask the module to include the attribute IDs into combination URLs? Do I need to rewrite numeric values into the combination URLs? Where to find my Business ID? My shop uses multi-currency : how to make Facebook detect the correct currency?